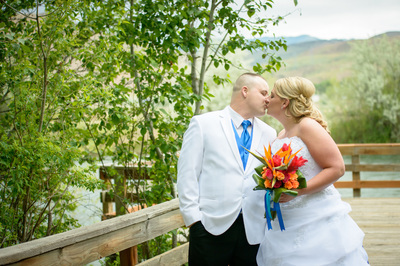 ﻿﻿﻿﻿﻿﻿This styled shoot was in Stanley, Idaho and was organized by Paula at Soft Elegance Photography. Complete list of vendors listed below. The flowers we created had a mix of King Protea, Limelight tulip Anthuriums, Juliet David Austin Garden Roses, Exotic Greens, Turkey Feathers, and many other unique flowers. ﻿Beautiful rainy day wedding... I guess rainy days are good luck! Lindsay & Dustin’s vintage vineyard wedding really was picture perfect. Starting with beautiful people- inside and out and all the way through every detail. Wood River Cellars is absolutely beautiful all the time– but especially in the fall. I was a spoiled girl at this wedding with perfect light, gorgeous trees and colors, and of course an amazingly accommodating bride and groom with exceptionally great family and friends. I definitely have to mention the stunning flowers by Georgia with Boise at it’s Best- I have never loved hydrangeas so much, and the bride’s bouquet was perfect… and even with a little personal touch of Lindsay’s grandmother’s brooch attached at the stems. Lindsay and her mother created and found everything for the wedding and Brandi and her girls at Soiree made it all come to life. The vintage candle sticks and chandeliers graced every table, silver frames, and gorgeous place settings made the tent at Wood River Cellars look different than I have ever seen it. They did a great job bringing it all together. I had a lot of fun shooting this wedding and then again while working on it I got to relive the excitement. Once the reception got kicked into high-gear at this wedding, the party was really rolling! Filled with I’d say a majority over-rule of Vandals at this wedding, it was quite the party and dance-off. The night flew by, and I was so honored to be a part of it. ​Brandi of Soiree weddings and events tapped into her true native roots for the inspiration on this one! Handcrafted bean-chevron weaves wrapped the vases on the sweetheart table. Brown ratton chargers and wool linens created an authentic but modern texture for the decor. We threw in a little glamour with the vintage white and gold china, gold glitter paper on the invitations and stationery, glitter and feather guest throw bags for the ceremony and glistening mixed patterned fabrics for the hand sewn floor poofs for seating at the ceremony. The ceremony altar was crafted from tall branches woven together with leather cord, tied with feathers and round reflective hanging beads to add our touch of glisten. They blew a little in breeze creating beautiful movement for the ceremony backdrop. The aisle was laid in hand cut out paper feathers that were painted gold and white, then tacked down to the dirt with little pins. We chose a barren location in the beautiful Boise Foothills- where it's yellow grasses and vast view of the treasure valley puts you at home with nature. We added to the natural palette with pops of color in the flower arrangements rich with peonies, coral bells, anenomes and more. Hair and makeup was very important for this shoot-- The natural makeup with a hit of coral and gold on the eyes adds a little drama to her look, and the tousled hair finishing in a side fish tail braid, wrapped in leather and topped off with a feather is absolutely breath taking. Our groom, was dressed in Gap denim skinny jeans, a BDG v-neck tee and a Kenneth Cole gray tweed vest. The mohawk, bolo tie and sage brush boutonniere tie him right in. The modern/native monogram is used on every piece of the stationery- and the neutral colors in the design are complemented by the pops of coral and turquoise in the paper layers. We jazzed it up with some gold glittery paper and envelope liners. Die-cut feather place cards are attached to the straws. 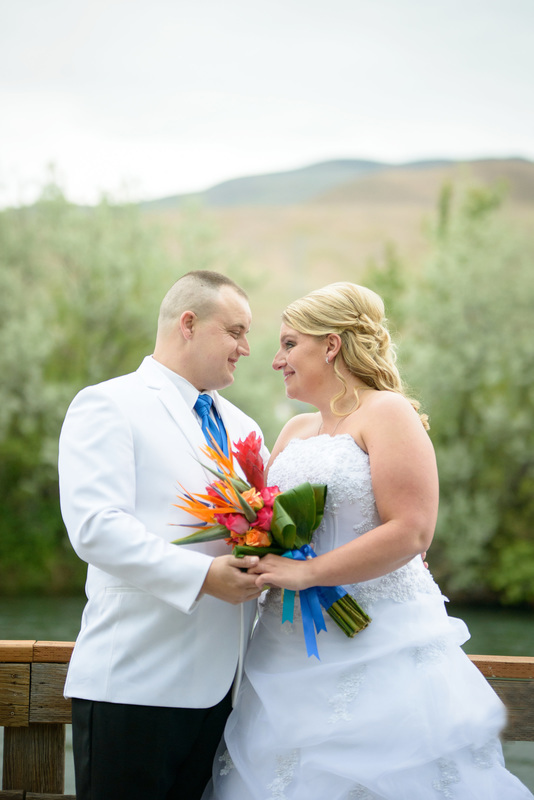 Bryanna & Matt Woodington October 11th, 2014?In snowy December 2013, Bry and Matt were married in front of family in McCall, but they knew they would celebrate with all of their closest family and friends almost a year later. Held at Matt’s family ranch in Nampa, the two invited their guests to take a peek into their lives together- from Bry’s southern background to Matt’s childhood in Idaho surrounded by horses. The reception was held in early fall, and Bry chose the loveliest shades of pinks, purples, and navy to embrace the season. Southern touches included mini gold jockeys, cotton in the centerpieces, and our favorite- mini passed chicken and waffle appetizer bites! Gold horseshoes and an elaborate mashed potato bar, along with the ranch as the setting for the entire event gave guests a grand Idaho welcome. The most memorable piece of the event was a replay of the entire ceremony and the couple’s vows; it was the perfect way to include the guests that couldn’t be with them at the actual ceremony, as well as a beautiful way for the couple to remember their wedding day.? Courtney and Dallas have a great story! They were friends in high school and even went to prom together. After high school Courtney went to college and Dallas enlisted in the military. They still kept in contact and Skype'd as much as they could. It wasn't until Dallas' last deployment that they both realized how much they loved and missed each other. Dallas made it official while they vacationed in Hawaii, so it is fitting that they brought that theme to their wedding. Courtney and Dallas wanted some fun tropical flowers, so we used Red Ginger, and Birds of Paradise. 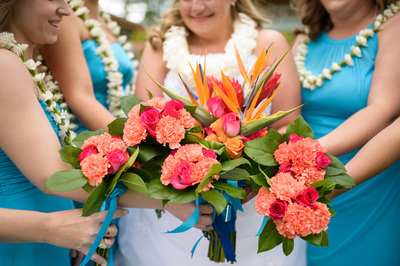 We paired those with some orange and hot pink roses wrapped in Ti Leaves. 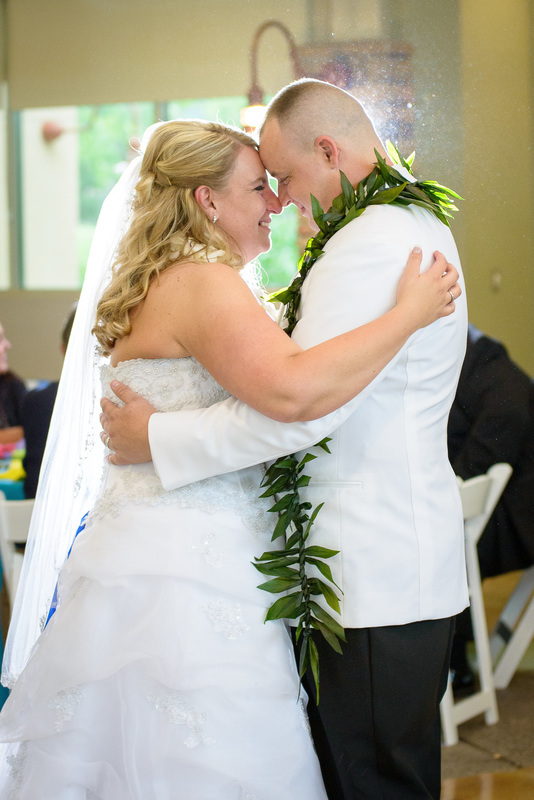 Their family had ordered leis from a separate company in Hawaii, but come wedding day, some had not arrived. They called us in a panic because they didn't know what to do. 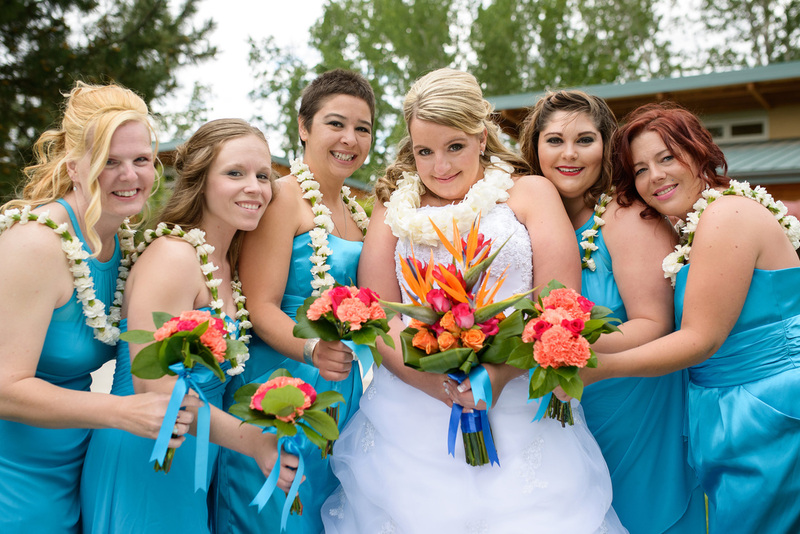 We assured them that we would take care of it and we made them some fun leis a couple of hours before the wedding. 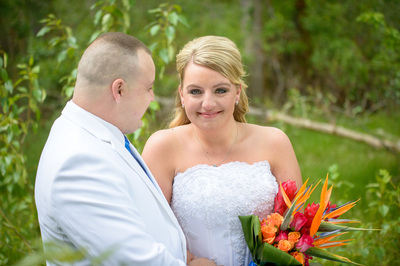 We were so happy we could help them out and make their special day beautiful. Below you will see their vendors and some fun pictures from their special day! Venue- Barber Park Event Cntr. Boise At Its Best has been featured in the Summer 2015 issue of McWED Magazine. 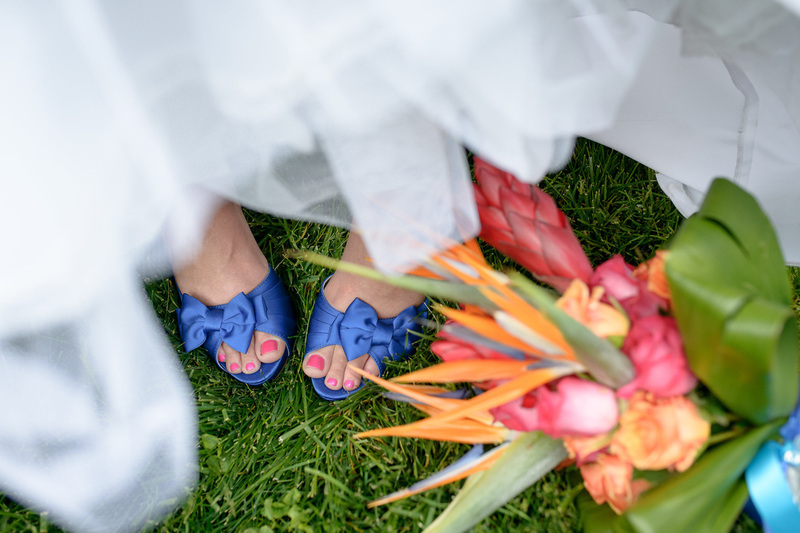 "mcWED is a style savvy resource magazine devoted to the growth and development of the wedding and event industry in and around McCall, Idaho. mcWED thoughtfully shares a commitment to couples to guide, inspire and connect them through their planning adventures founded with the heart of the local in mind" - McWED Magazine. We were fortunate enough to be a part of this shoot. We has so much fun creating all of the different floral components of this shoot. We used lots of fun flowers including: coral peony, orange dahlias, rosemary, garden roses, magnolia foliage, and Hawthorne branches. We used some very unique dyed muslin as an accent on the bouquet and it added a nice rustic feel. Another great addition was the foliage garland used to symbolize the unity of the bride and groom. It made for some very stunning pictures. A Valentine's Day to Remember! We had an absolute blast creating this wedding. When Jessica came to us to do her wedding flowers we kind of hesitated. Her wedding was on VALENTINE'S DAY!! But we were up for the challenge! We Usually do close to 1,000 orders the week of Valentine's Day so we had to make sure everything was planned accordingly. It was actually a breath of fresh air to step away from the dozen roses and get to use all of the fun flowers in her wedding. We had the opportunity to use Antique Hydrangea, Davis Austin Garden Roses, Lisianthus, Wax Flower, and Ranunculus. Her ceremony was at the gorgeous St. Johns Cathedral, and her reception was in one of the ballrooms at The Grove Hotel. "Boise at Its Best flowers is by far the best florist I have ever worked with. Hands down. They took on the mighty task of doing a wedding on Valentine's Day. It was hard enough to find a florist with the capability to do a wedding on this day, and one who would even want to, but this awesome shop was up for the challenge! Georgia and her staff were amazing to work with. They worked with my budget and helped create the vision of vintage that I was looking for. I originally wanted lots of pink roses, but as you can imagine on Valentines day, that was a little pricey. Instead, she offered great alternatives, which I ended up loving even more! The hardest part for me was trusting someone else to create what I was thinking of in my head, but I should have never had any doubts. Boise at Its Best exceeded my expectations. While other florists gave me a limit on how much they could do for that day, Boise at Its Best let my imagination run wild and completed everything! The quality was unbelievable. Everyone was ooing and ahhing over my flowers. I cannot thank them enough for making my day as beautiful as it was. If you are having any doubts about flowers, please choose Boise at Its Best." When we meet with brides and get them set up with their appointment for flowers, many don't know exactly what to bring. Here are some easy guidelines for your wedding appointment! 1. Pictures- If you have a wedding dream board or Pinterest, bring those pictures to your wedding appointment. It helps to have ideas of colors, styles, and types of flowers that you like. Ipads or Tablets are great to bring in to show larger size pictures. Don't worry we have WiFi! 2. Dress Colors- Color names can be drastically different depending on the store you purchase your dresses from. David's Bridal Olive color could be Alfred Angelo's Moss. So it is really important to either know the color your dress company uses or even bring in a swatch for us to match the color. 3. Guests in Your Consultation- it can seem like a fantastic idea to have you mom, sister, wedding planner, best friend , or grandma in your wedding appointment. Just remember the more people you bring to your appointment, the more opinions there will be. It is a good idea to only have the people who will be helping you pinpoint your decisions (wedding planner, mother, or whoever is going to be writing the check) Sometimes people may be offended if you don't ask them to join in your consultation, but remember, it is your wedding! 4. Flower Choices- It is always great to research the flowers you like before your consultation. Different flowers have different availability. There are a lot of flowers that are grown in greenhouses and available year round now. However, that doesn't mean that they will be the same price all year round. The peak season for Peonies is April - June. There are growers that grow Peonies year round, but you may be paying 4 times as much for a smaller flower. Your florist will have the best idea on the availability of many flowers. 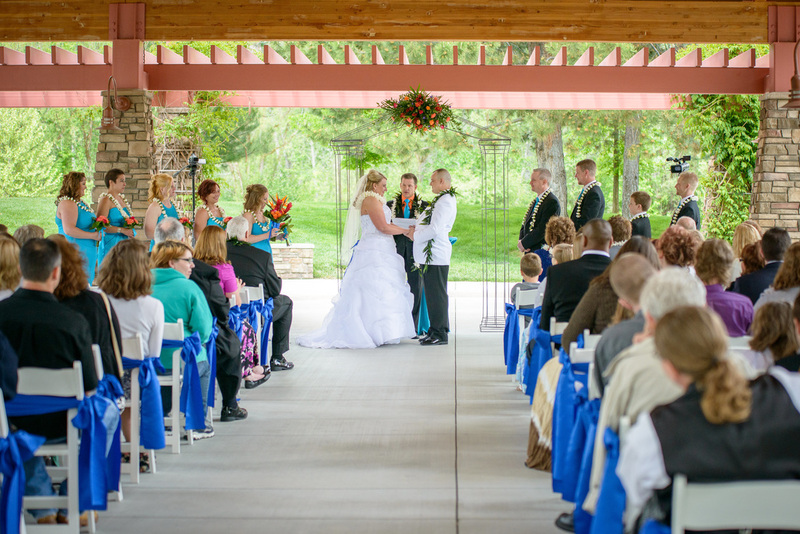 5.Deposit- Weddings can range anywhere from a couple hundred dollars to tens of thousands of dollars. Here at Boise At Its Best, we only require a $75.00 deposit to secure your date. We do a lot of weddings every year, but we give each one the time and attention they deserve. Depending on the size on the size of the wedding, we try to do only 4 weddings per weekend. Putting a deposit down is a great way to secure your date so we do not fill up. Securing your date with a deposit ensures that you can have the date you want and still have time to make any changes necessary to your wedding. 6. Trust Your Florist- It may not always be possible to see exactly what your bouquet or arrangements will look like. 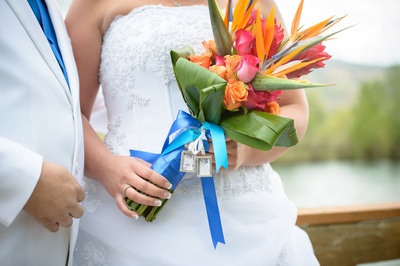 Our wedding designers have many years of experience in making gorgeous arrangements. We have a 100% guarantee on everything we send out, and will only give you the best for your day! 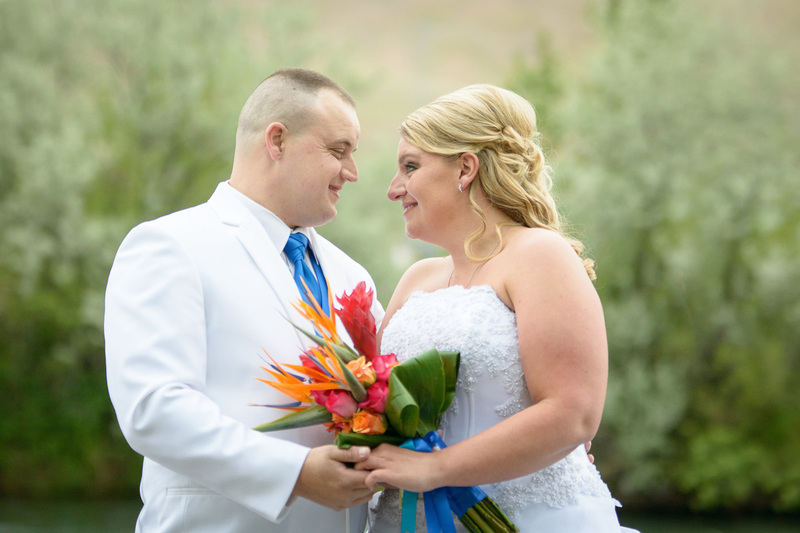 We can do weddings all over Idaho. From Coeur d'Alene to McCall to Sun Valley. Destination weddings are our favorite! Our designers Georgia, Sarah, Heather, and Steven have created some of the most beautiful weddings in Idaho.